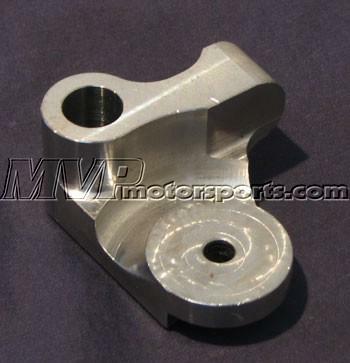 The Toyota OEM cast aluminum timing belt tensioner brackets are a weak piece that breaks from fatigue. We have found that power output, the type/brand of crank damper, or brand of timing belt do not affect when the stock timing belt tensioner bracket will fail. When the stock unit fails, the timing belt will jump and engine damage WILL occur. You will also be left stranded on the side of the road. One of the MVP Motorsports Supras broke an OEM Timing Belt Tensioner Bracket, and the result was an expensive and preventable loss. Our HKS 3.4L Stroker motor had the pistons scarred on top, the exhaust valves are all bent, and the head took some damage. Labor and parts replacement included a new shortblock, maching of the shortblock, new pistons and rings, new valves, repairing the head, new head gasket, timing belt, and of course a billet timing belt tensioner bracket to replace our stock piece that broke in half. Including labor we spent over $10,000 on something that was preventable. We are lucky metal did not circulate through the oil and cost us an entire stroker motor, complete head, and turbo! These billet chromoly units are a direct replacement for the stock unit and will not break. This upgrade is a great idea to do while replacing your timing belt and upgrading the Crank Damper, or anytime when you are installing a single turbo or already have a turbo conversion.